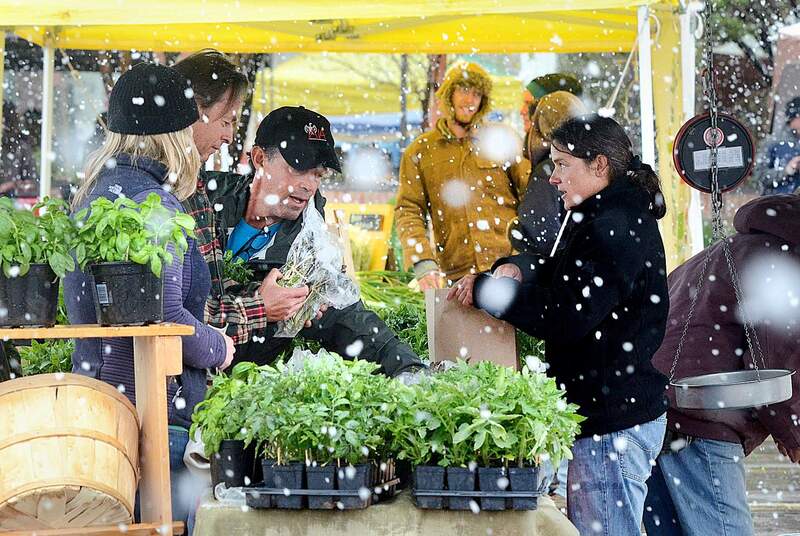 Shopping at farmer’s markets is one way the community can support local farmers, Linley Dixon, owner of Adobe House Farm in Durango, said Wednesday at a Green Business Roundtable. Linley Dixon, owner of Adobe House Farm in Durango, argued Wednesday that the organic foods industry has grown into a conventional agriculture business, both of which she believes use unsustainable farming practices. “The organic movement is no longer what the original farmers who turned the word over to the government intended it to be,” Dixon said at the Green Business Roundtable at the Henry Strater Theatre. Organic farms, Dixon said, have become industrialized as individuals looking to eat more healthfully caught on the “organic” trend. That’s led to massive monoculture farms that rely on fossil fuels for operations, typically with underpaid workers. Dixon, who has a doctorate in plant pathology, said communities should support small, local farms. Her own farm, a 3-acre plot off 32nd Street, yielded $80,000 in crops this year, and employed five people. However, smaller operating farms face some major challenges, Dixon said. The top challenges are the price of land in and around Durango and the lack of effective distribution of goods. The U.S. Department of Agriculture, in an attempt to generate more farms, instituted in 2014 a 2.5 percent interest rate (previously 5 percent) for landowners intending to use their property for agricultural purposes. Even when farmers have a successful growing year in Durango, Dixon said it’s hard to get that product to the customer. Despite the success of the farmers market and a handful of restaurants and grocery stores selling local produce, she said there needs to be a better local distribution system. “Our seemingly successful farm right now is very vulnerable to failure,” Dixon said. Without that support, Dixon said, the community risks losing locally grown, fresh food if the younger generation doesn’t take up farming. She said there are 28 million fewer farmers today than in 1920, and that farmers older than 65 outnumber farmers younger than 35 by 6 to 1. This story has been updated to correct a quote and the Adobe Farm’s location, and to clarify synthetic substance use on organic farms.